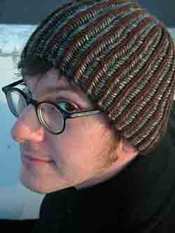 Bella Knitting: Hold on to your Hats! Ready set go! Run, don’t walk - grab your needles, two colors of yarn and your phone (more on that later). 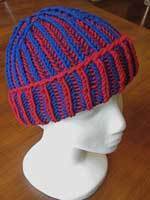 This is a 2-color brioche hat designed by our creative friend Arlette Thibodeau for Bella Knitting as part of our Independent Designer program. We first introduced Arlette in our blog as a fabulous photographer. She has taken some of our best photos. You’re going to want to get this pattern and try it right away. Really, trust me on this one. We never push our patterns but we demonstrated this at Stitches West from dawn to dusk, and every time we put down the needles someone else wanted to see it. We had groups, small and big, peering over our shoulders to see what was up and demonstrated until I was hoarse. I’m not sure I ever had so much fun at a trade show! • Both colors are used in every round. The other techniques pretty much work with one yarn and carry the other. You end up knitting two rounds to get both colors. Not in this case, both yarns are used in every round. Take a quick peek at the short video and you will see why it is so fun and why we call it the “Double Dutch” hat. • The decreases work perfectly on both sides too. I picture Arlette sitting up late at night trying to figure this one out. It is quite the accomplishment. Working with two color and two hands is a bit challenging – the knitting technique itself is not hard, it’s the going in two different directions (the whole walk and chew gum at the same time thing) that makes it so fun to figure out. We tried it in a group the first time and recommend you do the same (that's why you need the phone - to call your knitting friends). You’ll laugh, you’ll cry, you’ll make fun of each other … then suddenly someone will cry “I’ve got it”. As we mentioned on the video (yes, there is a video - we would never leave you alone with something new like this) it takes about 45 minutes for your fingers to catch up with your brain but you’ll enjoy the ride. Here is the NY Football Giants hat I knit after they won the Super Bowl this year. They were also super popular at Stitches and you'd be surprised how many different teams people support.Once we get going we are planning a Ravelry Knit Along. So stay tuned. Who should (can) knit it and how we help. The need for another hat is so not the point of this project. It’s all about the fun and learning something new. Do you know enough to give it a go? We faced this question a lot at Stitches. Some knew they just had to try it, some were scared out of their minds but most of those who were undecided felt a whole lot better after seeing the detailed pattern, the photo tutorial included and found out we were including a video too. I actually had a woman hug me at Stitches after seeing the pattern. She had been wanting to knit one some weekend ;) but just could not follow the pattern. I do have to say this is our best pattern ever as far details and level of support. Most people we talked to only knew how to knit with one hand, so did our test knitters. It doesn’t matter you’ll catch on – and that’s the fun of it. Even those that know how to knit Western and Continental will be challenged by the finger flow. It’s really just a coordination test! I would say anyone comfortable with knitting and purling should give it a try. Holding the yarn ‘properly’ in both hands helps a lot, if you don’t do that now it’s a technique that will hold you I good stead in all your knitting. Wow, what an unusual technique. I was talking to the video while watching youtube I was so excited!